For some reason I’m the only spectator who decides to sit in the first row. Most of the other rows are filled – maybe everyone else is far-sighted. House MC, Mark Woodbury greets the crowd and Celene Lyon lists previews of next season as this is their final show of the current season. It’s actually a rescheduled date due to the inclement weather that fell on January 7. She also reminds us to sign up for the giveaway of tickets to the Falcon Ridge Festival. Rev. Derek van Gulden offers a prayer of peace and we’re off and running as Putnam Smith gingerly hops on the stage. He radiates great friendly energy and shows it in “The Birds Would Understand” from his latest CD 99 Desires. Putnam loves gardening and the short growing season up in Maine is perfect to balance his busy touring schedule. As a musician I am amazed at his playing dynamics that fluctuate on almost every line, letting the listener easily hear everything he sings. It’s like his own call and response technique. He sings about his grandpa in “Gold Rush” then he brings up Connor Garvey to help out with “Gotta Go Where the Love Is.” He encourages the audience to sing along, mentioning how the urban hipsters of Portland, Oregon, thumb their nose at such an activity. Connor then reminds Putnam that he was once a resident of that city. All those from the right coast happily sing along – so does Connor. Putnam tells us that the curious title of his CD comes from him getting relationship consoling where he was told to instead of thinking of three important things he’d like in a mate, to think of 100 things. Putnam acknowledges his parents in the audience and plays a song inspired by his dad’s tales of the hurricane of 1938. It ends with some sizzling banjo pickin’. He switches over to the piano and does a mini-set there that starts with “The Artist Up on the Hill.” The song came by way of Putnam trading banjo lessons for website work. It’s seems that his web master had some amazing stories to tell, and those tales became lyrics in this song. 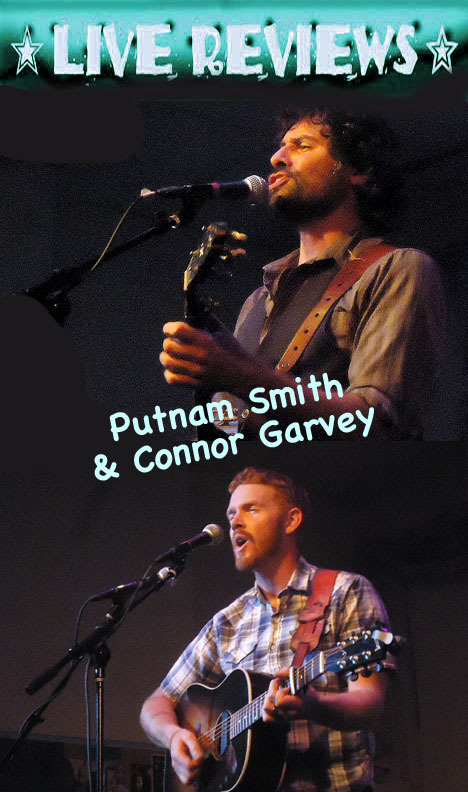 Connor Garvey is invited up again for a finale that includes Putnam playing mandolin behind his head and swinging Pete Townsend windmills, all culminating in a synchronized leap that crashes in on the ending chord.